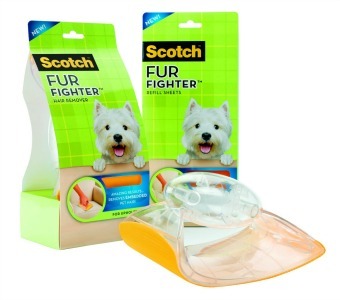 Below are several reviews, and before and after using the Scotch Fur Fighter pet hair remover. Basically what this product is a kit that includes a handle applicator that you put these little disposable sheets on, and they pick up pet hair, using a textured pad. 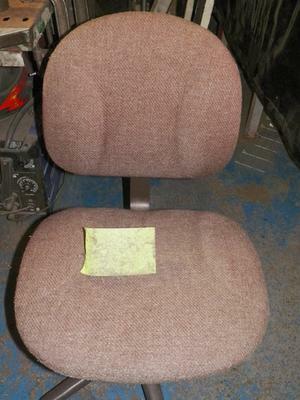 The advantage of this over some other products is the fact that it can remove embedded pet hair, such as when it's stuck in the upholstery or other surface. This means many people like to use it for tasks where a vacuum just doesn't work as well. It can also get into tighter spaces where a vacuum can't reach, or is less effective. Of course, some people like to reuse the pads, so they don't have to buy refills quite as often. I completely get that! For example, Diana De Avila shared a close up picture of this product (it now also comes in orange colored pads, not just these green ones). 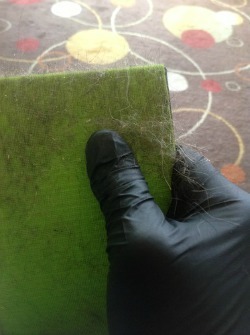 She said, "Swipe in whatever direction to get the hair off the pad and create a fresher, reusable surface." Diana also said, explaining what you're seeing the picture: "Lots of cat hair! I use a nitrile glove and use my thumb to remove hair and get more use out of each pad. Without the glove, the hook and loops can be abrasive on the bare thumb. Once cleaned, the pad is very effective again. This is after 5 cleanings already." I love before and after pictures, since I think they give a really good indication of how well a product really does work. 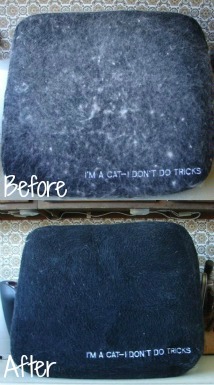 In this one you're looking a cat bed, which obviously in the before picture is absolutely covered in cat fur. David K. Watson shared what it looked like after he used three pads to clean it up. What a difference, don't you think? Cleaned Up This Chair In Shop With Nine Cats! This final picture is an after picture shared by J. Robson. He said this is a "close-up of the fur remover after cleaning seat in sheet-metal shop (and NINE cats)." I would love to hear from even more people who've used this product, sharing how it has worked for you, good or bad. You can share your reviews here of this brand, or any other, or read other reviews already submitted. In addition, this isn't the only pet hair remover product from Scotch Brite. In addition, there is also a sticky tape roller product. You can read reviews of Scotch's pet hair roller here.